Anyone else have notions of parenting being an innocent world of fluffy kids TV, beige dinners, cuddles before bed and cute artwork that you hang on the fridge? We love our kids, and everything that comes with being their mums and dads, but sometimes, they come out with some of the most sinister, unnerving things imaginable. From threats to younger siblings to unknowingly mournful declarations of love to parents, our offspring have given us actual horror-movie chills on more than a handful of occasions – and now it turns out, when kids aren’t saying creepy things, they’re drawing them. We’ve done some research and found 15 of the creepiest kids’ drawings the internet has to offer. 3. Okay, the film wasn’t great, but is THIS really necessary? 12. Satan, Santa, basically the same deal, right? 13. If you squint really hard, it’s just a scarf with pom poms? And presumably had nightmares until the end of their days. 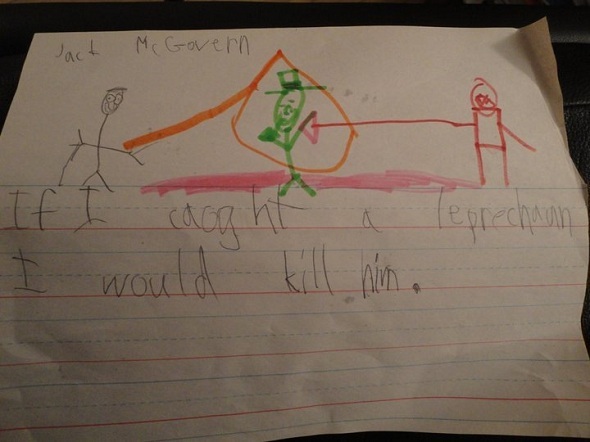 Send us a picture of the creepiest drawing your kid has ever done and we’ll add the best ones to our list!